Linda Sundram gave a passionate, spirited presentation on The Rotary Club of Camp Pendleton. Chartered in 2005, this was the first Rotary Club on a military installation. The club has a current membership of 17 individuals who like to consider themselves small, but mighty. Club members hail from both the military and civilian communities. The emphasis is on assisting military families on Camp Pendleton and surrounding communities. 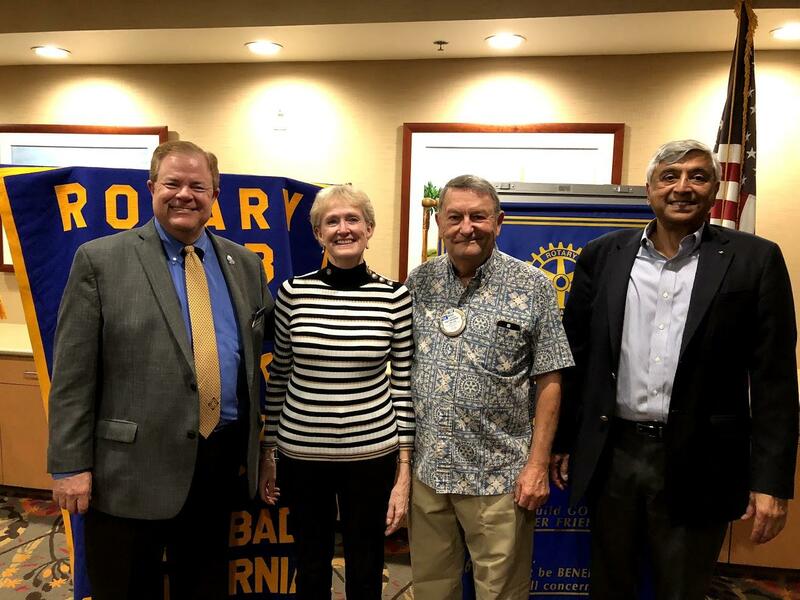 Rotary Club of Camp Pendleton has sponsored a multitude of projects through its fundraising activities, partnerships with other Rotary Clubs and a strong relationship with the residents of the La Costa Glen Retirement Community. Past fundraising activities have included their formal ball, Dancing With Heroes; a recent golf tournament, Golfing With Heroes at the Camp Pendleton Marine Memorial Golf Course, and the Defender Bowl football game and holiday activities at La Costa Glen. In addition to supporting many international programs, the club’s major local projects include the Camp Pendleton Memorial Wall which honors the fallen of Camp Pendleton during Operations Iraqi Freedom and Enduring Freedom; the Memorial Garden at Camp Horno, which offers a place of solitude and repose for military and their families; the Warrior Warehouse which provides at no cost to needy military families, donated furniture, appliances and housewares; a significant contribution to Nice Guys of San Diego to place a handicapped-accessible cottage on San Onofre Beach; a significant contribution to the Veterans Association of North County’s (VANC) building fund; support for the San Diego Symphony’s Home for the Holidays and Salute to the Military programs, Operation BIGS, military unit events; volunteering at the Marine/Navy Relief Thrift Store, and many more. In conjunction with Joint Medical, members of their staff offer complimentary massages to the military (on various Fridays) at the Warrior Warehouse during business hours. Past President Linda Sundram, heads the coordination and collection of donated items on her twice-weekly pickups in San Diego and Orange counties, while several members organize and man the Warrior Warehouse on Fridays from 10:00AM-2:00PM.